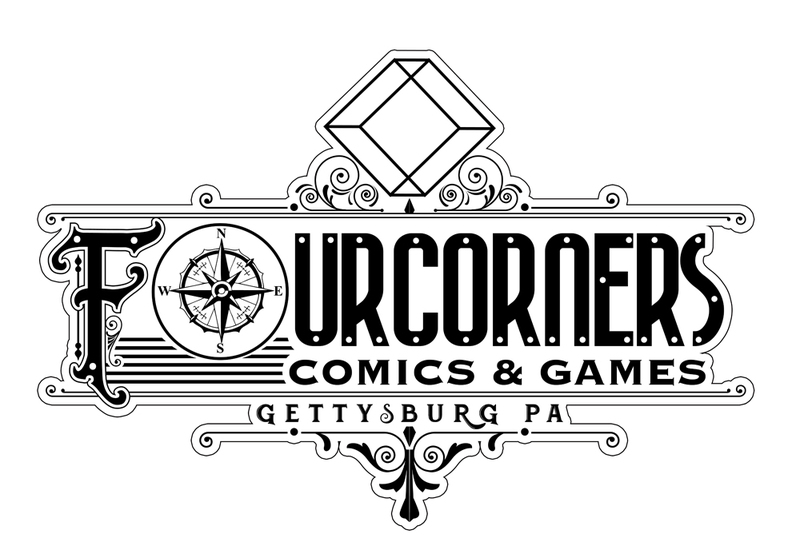 At FOURCORNERS COMICS in downtown Gettysburg, PA you’ll find everything you’d expect from a small town comic shop – the latest comics, great back issues, toys, games and other pop culture goodness. On further inspection, we hope you’ll find more. We’ve made a habit of popping into comic stores across the country (and the world) and at each shop there is always something that catches our eyes, something that sets it apart and we think “Wouldn’t it be great to see that at our local shop?” Fast forward to now, FOURCORNERS is the culmination of our love of comic books, the art and writing that creates them and our commitment to introducing that love to new readers each and every day. In addition to the great selection of kids books and graphic novels, the fresh-off-the-press comics and new and vintage toys (you should see our selection of G.I. Joe), you’ll also find Magic the Gathering, Heroclix, D&D, Star Wars Legion, Warhammer and more. We invite you to play in a casual game or tournament in our Game Room or drop in for one of our events. There’s one other thing we hope sets us apart – we believe that comics are for everyone. So, ask us for a recommendation. If you can’t find it on our shelf, we’ll get it for you. And above all we’ll greet you with a smile. Welcome to FOURCORNERS!